Step Right Up: How Doc and Jim Key Taught the World About Kindness is the extraordinary biographical story of William "Doc" Key and his horse Beautiful Jim Key. Despite being born into slavery, Doc Key became a self-taught veterinarian and developed his own medicine line Keystone Liniment. He embarked in several successful business ventures. One of his dreams was raising a champion racehorse, but his purebred Arabian horse named Lauretta gave birth to a weak colt. Doc Key was a kindhearted man who loved horses so he took really good care of the colt, who he named Jim Key. Doc Key and Jim developed a special bond. Jim turned out to be an astonishing smart horse. With lots of kindness, Doc Key taught Jim to do tricks and math, read, and write. In 1897, he showed people what Jim could do at the Tennessee Centennial Exposition. Since the audience loved their show, they got a manager and went on the road. They became famous and Jim became known as Beautiful Jim Key. Doc Key faced prejudice and racism along their journey, particularly in the South. What is more, humane societies questioned how he treated Jim. They thought abuse was the explanation behind how Jim did all that. Doc Key proved them wrong and taught them all about treating animals with kindness. 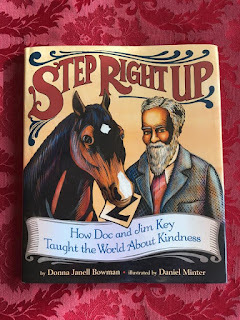 Step Right Up: How Doc and Jim Key Taught the World About Kindness is Donna Janell Bowman's debut novel, and I hope to read more of her work. She managed William "Doc" Key's biography and the subjects of slavery and racism with respect. 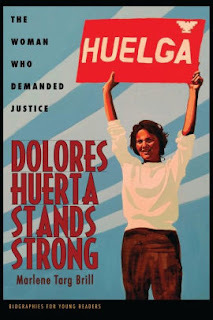 She included an afterword with historical information, photographs, and sources about his inspiring life. The text comes alive through the splendid linoleum block prints of award-winning illustrator Daniel Minter. That light is present even in the darkest of times is one of the most important lessons for kids in this book. Doc was born into slavery, and even though he became a successful business man, he continued to face racism and prejudice. Despite of all that darkness, he kept his light and kind heart. With his caring relationship with Jim, he contributed immensely to the cause of treating animals humanely. 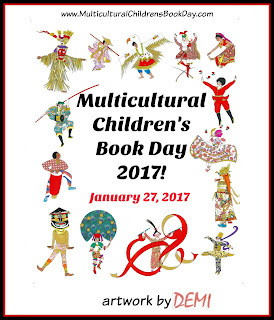 Children can think about significant subjects with this book. How to proceed in the face of prejudice? What is the importance of kindness? How we should treat animals? Do I step right up for a cause? 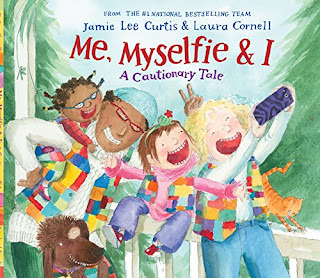 An activity children can do after reading this book is learn about the work the Humane Society of the United States is doing in the present to help animals. They have an informative section called Just for Kids. I reviewed Step Right Up: How Doc and Jim Key Taught the World About Kindness by Donna Janell Bowman for Multicultural Children's Book Day 2017. Thanks for the review. I must read this one.